Details:Material: Carbon steel, alloy steel and stainless steel. CCS, API, and ISO9001: 2000 Certificates etc. SS cap for pipe and glass fittings. Size/Diameter: 1/8 inch NB TO 48 inch NB. 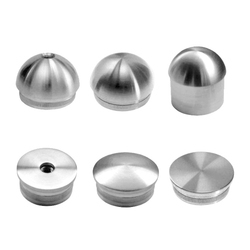 We are offering Stainless Steel Pipe Cap to our client. Raal Stainless Steel Pipe Cap, Size/Diameter: 3/4" - 12"
We are offering our customers an excellent quality range of Pipe Cap. These products are manufactured from qualitative range of raw materials, which is quality checked by our team of experienced professionals. Navgraha Steel & Engg Company offer these SS Pipe Cap at most competitive prices.